This description is from David Temple, the museum’s curator of paleontology. He’s chosen a selection of objects that represent the most fascinating fossils in the Museum’s collections, that we’ll be sharing here – and at 100.hmns.org/ – throughout the year. Timelines are an important element to telling a story through exhibits. 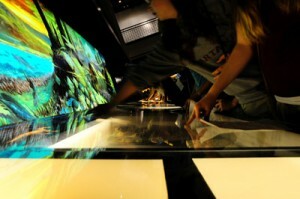 At the Houston Museum of Natural Science, early life on Earth is recreated in a linear timeline, with the fossils themselves as the “stops.” The time represented is collectively grouped as the Paleozoic period, and accounts for around 300 million years of the history of life. The fossils displayed on the wall form the stops on the time line, grouped by famous localities that historically defined the sub eras: Pre-Cambrian, Cambrian, Ordovician, Silurian, Devonian, Carboniferous, and Permian. This is appropriate as, prior the development of technology that allows paleontologists to compute absolute dates, the divisions between the geologic periods were defined by the fossils present in geologic layers. At first glance, the fossils in the case may appear similar, but they are very different, and come from many of the type localities that created the boundaries. To bring this timeline to life, a vibrant visual motif was created. Mounted behind the fossils is a brightly lit graphic that unfreezes the animals from their rock prisons and remembers them as best we can, alive and in their natural environments. This motif came from an original oil painting commissioned by the Houston Museum of Natural Science. The Paleozoic diptych, painted by acclaimed paleontology artist William Stout, is titled “Life Before the Dinosaurs.” The original oils have never been exhibited publicly, but grace the walls of a conference room. Wander among prehistoric beasts in the Paleontology Hall, a permanent exhibition at the Houston Museum of Natural Science. You can see more images of this fascinating artifact – as well as the others we’ve posted so far this year – in the 100 Objects section at 100.hmns.org.